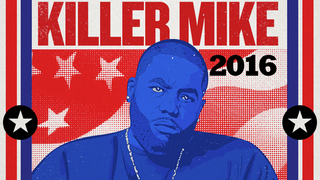 The people have spoken, and the people really want Killer Mike to run for public office. Yesterday, he tweeted that you should write him in as a candidate in the current Georgia State Senate election, which quickly lead the internet to believe he was actually running. He’s not, he later clarified. At least not this time, because he’s a little too busy touring with Run the Jewels. But he insists that one day, it’ll happen. So we made him some campaign posters for when that day comes. Mike’s entry into politics makes sense (except that he’s way too good for politics). He’s been outspoken on a number of political issues, from police brutality to the legalization of marijuana, and now frequently makes the rounds as a talking head, from CNN to Larry Wilmore’s The Nightly Show. So he’s perfectly primed for 2016, and thanks to Gawker Media illustrator Sam Woolley, he’ll have some campaign art ready to go. The slogans, of course, are taken from Mike’s own lyrics. We especially like this one. Oh, and meanwhile, get out and vote! Even though it’s not for Killer Mike.